BSAG » Electricity + water = ? Electricity + water = ? This was my shower in the Pantanal, which I found it quite entertaining. The combination of bare wires, electricity, bits of casually-applied electrical tape and water had a kind of devil-may-care bravado about it, and I liked that fact that there were no nannyish notices around, warning you not to touch the heat setting lever1 once you'd turned the water on. It felt like being treated as an adult, not an idiot. While I was there, I was musing that this kind of thing wouldn't be allowed in the UK, where we tend to be quite scrupulous at separating water and electrical devices. Apparently, I was wrong. We've had a problem for a while with a light fitting in the kitchen which is directly under the bath and shower. The bulbs keep blowing (tripping the circuit-breaker on the lighting ring main). Then this morning, all the power went out in the house, closely followed by an anguished bellow from Mr. Bsag, who was in the shower at the time. 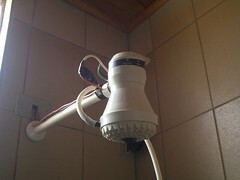 The electric shower had tripped the circuit-breaker, this time cutting all the power. I reset the circuit, but the same thing happened three times before Mr. Bsag gave up and filled the bath instead. So it seems that water is probably getting in to the electric shower unit somehow, and probably also getting in to the light fitting below in the kitchen and shorting it out. The irony is that if we had one of the Brazilian showers, we'd be able to see what the problem was because the wires are all on display. As it is, we have to wait until an electrician can come round, and put up with the tedious process of running baths.